French-based artist duo Jingfang Hao and Lingjie Wang’s first solo exhibition at White Space Beijing transformed the gallery space into a quiet amusement park filled with studies and experiments on machinery, technology, material and natural phenomena. Here, installations of droplets of water and falling leaves, and drawings of the daily movement of the sun in the sky formed an eternally looping display that constructed an immortal man-made world. Each installation represented the subtly moving trajectory of a different, essential—yet imperceptible—wild element. 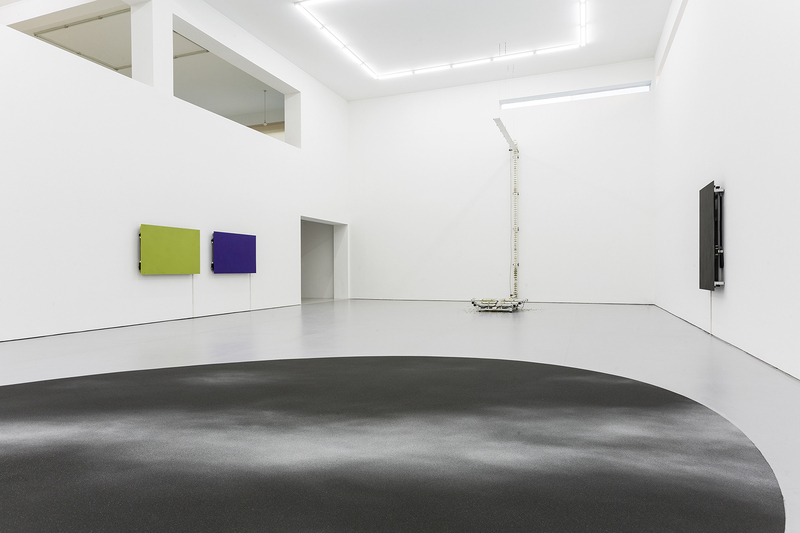 In one of the two exhibition halls, 28 works from the series “Sun Drawing” (2014–17) was mounted in a horizontal line on a wall. The circular, flat works on paper were reminiscent of traditional Chinese paintings on silk. These prints were produced by an artist-made instrument that used optical devices and thermal paper, and trace the sun’s daily path. 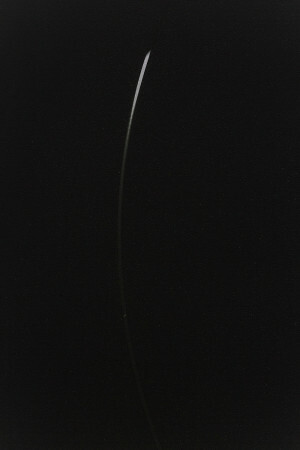 Standing in front of the works—each one featuring a variation of a semi-circle seared onto the paper —viewers were able to imagine the temperature and light exposure on the day it was recorded. 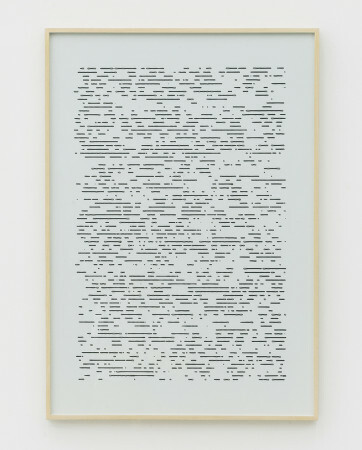 In recording long, short and intermittent rays, or the lack of visibility altogether, the duo has allowed the sun—a presence both familiar and distant to us—to “write” its own diary, creating a visual effect that is monotonous yet calming—a kind of metaphorical graffiti revealing subtle variations in day-to-day emotions. 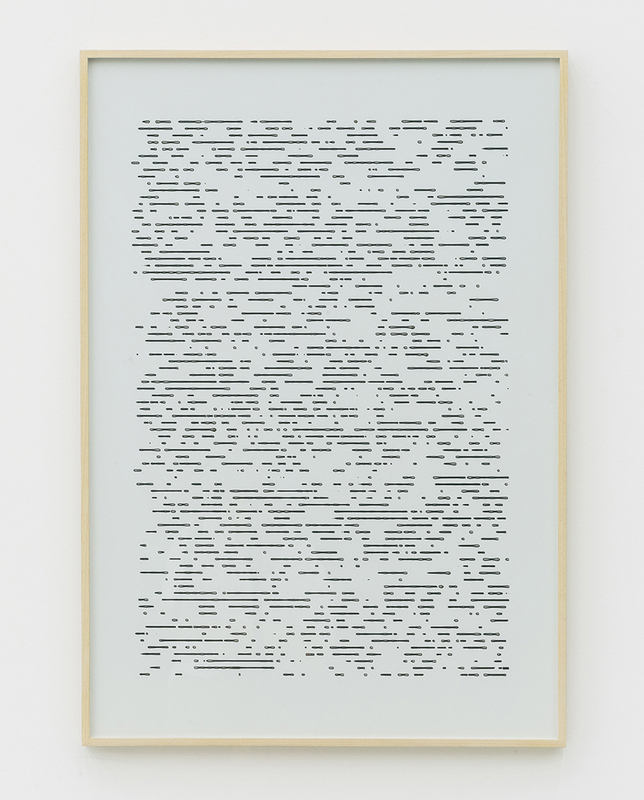 This work is evocative of On Kawara’s “Today” paintings, which marks the expansive and endless flow of time through sets of austere, monochromatic numbers depicting the dates on which they were made. Similarly, the duo highlights the simple, eternal symbol of the fleeting nature of time and the inevitability of its disappearance. On an opposite wall to “Sun Drawing,” several aluminum panels were installed, upon which a glass microsphere was pasted. An LED light overhead caused a rainbow spectrum of color to appear in a flawless arch across these metal boards. This was the result of countless optical experiments, where the artists had found the optimum equipment and conditions for reproducing an artificial rainbow. 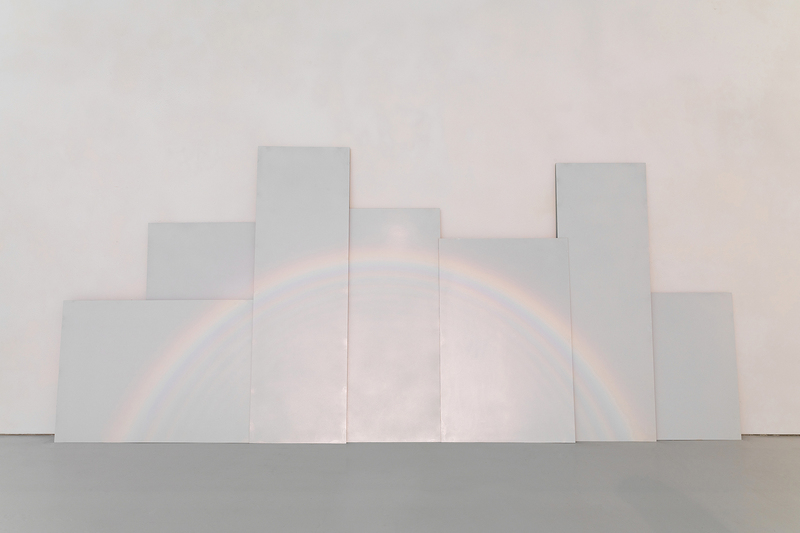 The intangible, ephemeral visual phenomenon, which can usually only be captured by taking a photograph, is transformed into a stable, constant “object” that can be observed for a relatively long period of time in the exhibition space. Additionally, the artists have concentrated the magnificent image—which typically stretches into infinity in the sky—into just a dozen square meters, allowing the viewer to encounter it in a mundane, small-scale context. Both the obsessive drawings of the sunrays and the recreation of the rare spectrum effect brought to the fore grand questions about cosmic matter, in which the inescapability of the dissipation of time and the inability to capture the idea of space makes us realize how tiny and powerless we are. Scenes of natural beauty tend to appear randomly and disappear quickly after, yet here the artists have manipulated variables to create these moments again and again, creating poetic and endless landscapes. The artists’ starting point or inspiration has always been rooted in a curiosity toward conceptual imagery or an illustration of the motion of matter. Via careful physical and technical studies on materials, they build up appropriate environments to incubate dazzling scenes. Moved by discussions on the meaning of animal and human life in the The Human Condition (1958), penned by political theorist Hannah Arendt, the artists developed the series “In a Universe Where Everything Moves at All” (2015), which was hung in the other hall in the space. 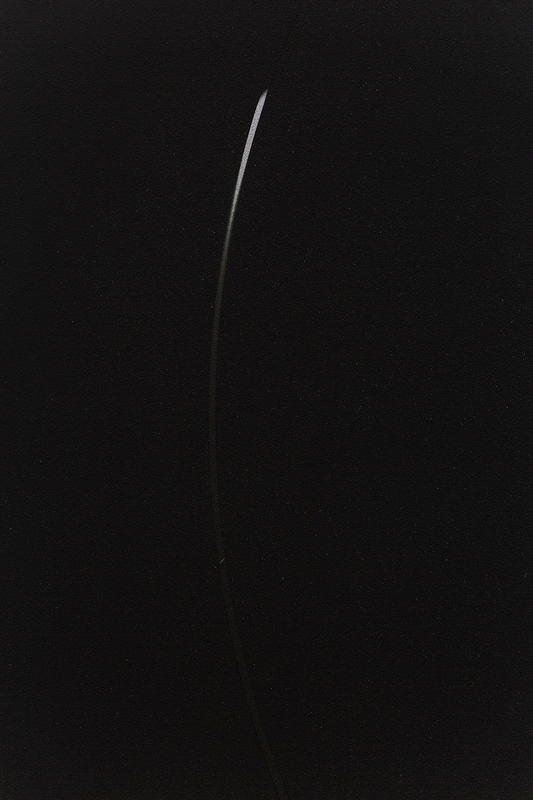 The duo used thermal paint to produce a seemingly enormous coal-black background, and then programmed a laser point to move like a comet across the surface, leaving behind a gradually disappearing trail of light. Viewers might have missed the tiny white-hot point altogether until they stood adjacent to the work. The imperceptible dot moved extremely slowly across the black abyss, as if it were a lonely but persevering individual traveling through the immense universe. These installations were unique not simply because of the diversity of their materials, but how the artists modestly dealt with them. Their work enhances our perception of the elements around us, reminding us of the infinity of the vast universe and allowing us to calmly revisit our place within it.